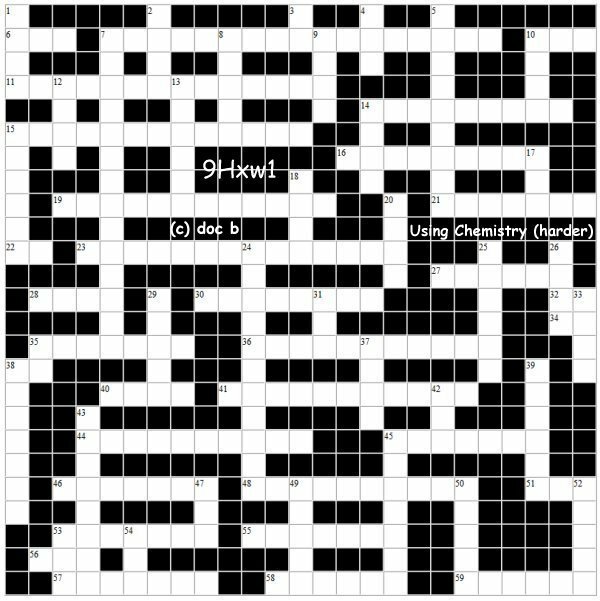 The BIG KS3 Science-Chemistry crossword on "USING CHEMISTRY"
21 Electronic devices can now (7)? the environment 24 hours a day. 27 Mixing chemicals to give an exothermic reaction can be used as a hand (6)? 34 Green dyed plastic well lit means (2)? 51 Companies must regularly come up with a (3)? product to compete in the market place. 53 The result of any chemical reaction, it makes a new (7)? 2 When you examine the structure of materials in increasing detail, you eventually get to an (4)? 14 All modern companies and the teaching profession go in for a (4)? of action for the future but please preserve us from drowning in paper! 20 A simple one of these is made by dipping connected zinc and copper strips into salt or acid solution but we are built of different type of (4)? 26 Saves lives as well as taking them with (4)? abuse. 50 Iron, oxygen etc. are examples of the (5)? of elements.